She Is Dr. Susan Cernyak-Spatz, Holocaust survivor . . .Lecturer, Professor, Mother, Grandmother . . .and an amazing woman I am fortunate enough to call “friend”. Until just a few years ago, when I thought about the atrocities and horrors of the Holocaust, like most Americans, my mind was limited to what might be a considered a vicarious “Schindler’s List” type of experience. I perused the History Channel for documentaries on the subject, visited the Holocaust museum in Washington D.C., and watched each and every Hollywood version on the big screen. Up until I met Susan Cernyak-Spatz, the most personal experience as a non-Jewish outsider looking in, was my hauntingly surreal trek up to the steps of the Anne Frank house in Amsterdam. As I rounded the corner, fear gripped my chest and my heart began to pound into my ear drums. I realized each step I took, my shoes were striking the exact same brick path the Nazi soldiers, only a few decades before, marched across to capture their intended prey. I could see their uniforms, hear the sound of their strident boots marking time with death, as if in a trance. . .I could smell the fear. My mind went back to Anne’s own account from her treasured diary, in that moment, I was transferred back in time. The first time I saw Susan, she visited a fitness class I was teaching at the Jewish Community Center. In instructor mode, I was (as always) animated, giddy and probably a little frivolous. Susan walked in and joined the class already in progress. I introduced myself to her. That’s when my eyes saw it – 34042 branded forever on her arm – knowing exactly what that meant, I found myself suddenly thrown into an internal meltdown. Shocked into sobriety, I struggled to speak and cue the next move. Within minutes, she left . . .turns out she was in the wrong class. After it was over, some of the students shared her identity with me. 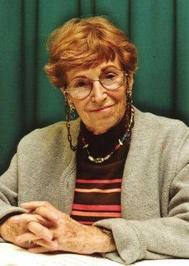 She was Dr. Susan Cernyak-Spatz, professor at UNC Charlotte, Holocaust survivor and well-known lecturer on the subject. Several years later, in the midst of channel surfing for something decent to watch on T.V., I saw a familiar face come across the screen. It was Dr. Cerynyak-Spatz. She was lecturing to a group of students at the University. My hand froze on the remote. . .I was transfixed. Hearing her tell just a portion of her personal story, left my hungry to know more. I want the reality to sink into my bones, I desperately want to find some inkling of comprehension of the human condition which was capable of such evil. I pray I get a chance to get to know her. Not long after that, I walked into the JCC, only to find her sitting at a table outside of the aerobic room. I approached her, introduced myself and began a conversation. I invited her to attend my Therapeutic Ballean class which would give me the opportunity to give her more individual attention. Much to my delight, she attended the very next class. At 89 years young, she was amazingly strong, flexible and of course, fearless. Because the format includes hands on stretches and massage, I got to touch the permanent reminder of her hell on earth. As my hand gently swept across her tatoo, I felt my throat clinch, I quickly turned my head away to fight back the tears. If I could have, I would have embraced her arm for hours. . .as if trying to receive a glimpse of history through osmosis. I felt overwhelmed, blessed and even more determined to connect. Fortunately for me, she enjoyed the class and announced she would be attending as often as she could. I asked her where I could buy a copy of her book,”Protective custody Prisoner 34042.” She brought me a copy the next class and thus began my journey of what I consider to be the ultimate privilege – the opportunity to get up close and personal, face to face and soul to soul with an eye-witness to the most heinous, unspeakable war crimes in modern-day history – I am honored, completely humbled and inspired beyond my utmost expectations. Coming Soon: Part 2 THE BOOK, complete with pictures of young Susan and her parents. Good job, Alison. Susan is a walking inspiration to us all…..I look forward to part 2. Your story – and hers – are especially meaningful reading today. I just learned that the Simon Wiesenthal Center has charged today that recent statements by Iran’s Supreme leader, Ayatollah Khamenei along with a detailed blueprint for the destruction of the Jewish people posted on a website run by the head of the Iranian Parliament’s research center, constituted a pre-genocidal crime against humanity, unparalleled since Nazi Germany. People have belittled the enormity of the Holocaust, and with fewer and fewer survivors each year, we will soon enter a time when there are no longer living testaments to the horror. Thank you for starting a dialogue on this — we must keep the truth alive. Susan is most definitely an inspiration to us all, and a constant pillar of strength and courage. I too feel honored to consider her a friend.